Designed from both mineral and synthetic base stocks to provide maximum benefit to all sport applications, this oil is blended to handle the high stress found in competition engines. Our exclusive blend minimizes frictional losses while providing critical protection against ring wear and piston scuffing. 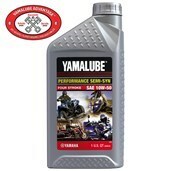 It resists thermal breakdown with race-inspired lubrication for riding on the road or in the dirt. Meets or exceeds the JASO MA requirements for wet clutch operation and gear protection.